Costa Rica: home of sloths, monkeys, dishes containing beans and rice, people shoved into clothing so tight they looked like the gently sloping wrinkles of a croissant, exotic new nauseating scents, geckos visible only to Meaghan's eyes, earthquakes, terrifying taxi drivers and hospitals. Many, many hospitals. And over the past week, we've visited some of the best of them! Let's place you in the shoes of a Costa Rican taxi driver. To get into character, please imagine you understand a complicated language of honking, and that you conceptualize following distance as "I'm not touching their car, and therefore we're cool." Now please imagine you are standing outside the arrivals terminal at the San Jose International Airport, and you see this duo: a small blond girl with a concerned look on her face, and a tall brunette who is pale and sweating like Mike Tyson at a spelling bee. Unfortunately for you, she also has by far the greater Spanish fluency of the two. "Donde esta la, um, hospito? Hospitalo?" says the blond to you. "NECISSITO. IR. A. UN. HOSPITAL. POR FAVOR. RAPIDO!" snarls the brunette. The taxi driver was eager to drop us off here. This was the unfortunate way we entered Costa Rica this past week. It was Amy's first trip out of the country, with the exception of about 5 hours she spent in Canada that one time; it was Meaghan's first time visiting a country where she had studied the language at all prior to crossing the border. Was the trip a total disaster? Hell no. 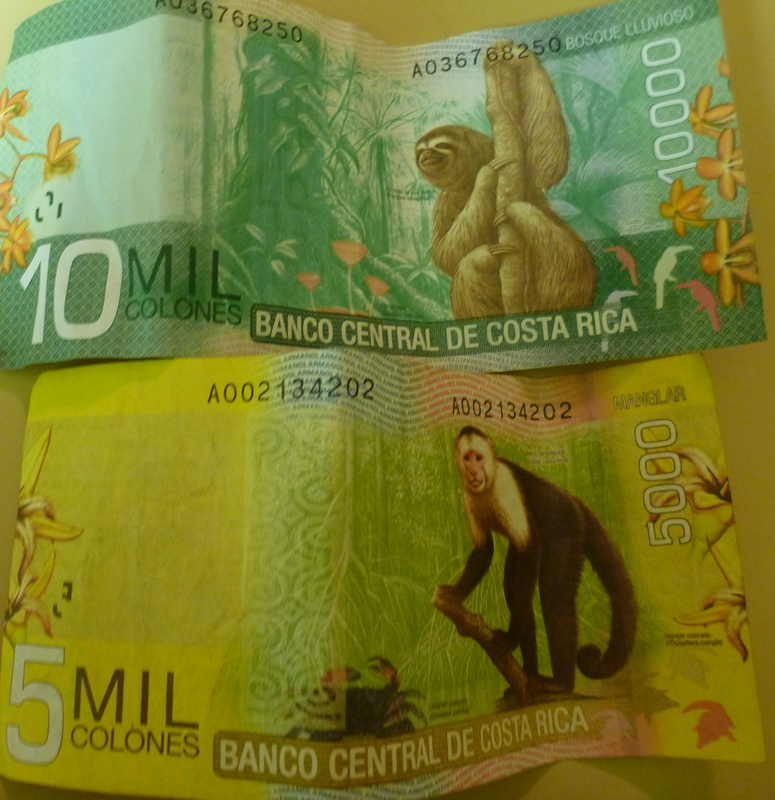 Sure, the only sloths and monkeys they saw were the currency the taxi drivers gave them as they drove to and from the Hotel Brilla de Sol and the Clinica San Miguel, but there were some great things too. So cute, but not so cuddly. So let's break it down into a list of awesome encounters that made this trip great, despite that Amy spent 75% of it trailing an IV bag and smelling faintly of half-chewed fried rice and Costa Rican anesthetic. For one, this set the bar super, super low for any future travel. Literally, if Amy can arrive at a place without vomiting prior to touching the ground that will be a HUGE WIN. For two, they survived a damn earthquake! Cuddled together, half-passed out (Amy from Morphine, Meaghan from Amy's overwhelming scent) on a twin bed, they looked up from episode who-knows-how-many of White Collar to find the whole world was gently vibrating them with, as Amy described it, the 'cool attitude of the local people." Of course, Amy was also on a lot of morphine; Meaghan felt more like they were a seal trapped in the jaws of a gigantic killer whale. 4.5, 10 km below the surface... essentially it was a NEAR DEATH EXPERIENCE. For three, they totally saw some wildlife. There were two genuine Costa Rican Squirrels, which admittedly were a bit more exciting when Meaghan thought they were small monkeys, but they were still pretty cool. Also, there were black vultures: just like regular vultures, but black! Meaghan totally stands by the whole gecko thing, even if they were too shy to hang out with Amy. Finally, there was that one cat. 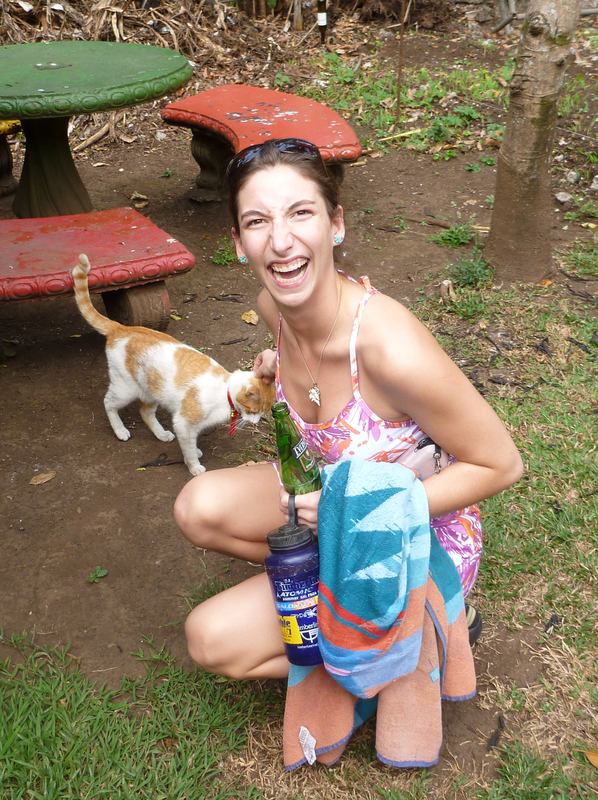 That cat was pretty great - it spoke spanish! "I said Hola Gato and he came right over!" For four, the people there are incredible. The manager of the hotel we stayed at was very kind, and very worried about us every time we had to return to the hospital. The secretary who spoke fluent English made sure to stay in contact with our doctors even when she was off shift, acting as translator via text. There was also that lady whose job wasn't clear, but who made certain to soothingly pet Amy's head and whisper "Shh, shh, tranquilla, tranquilla" for long hours late into the morning. The doctors were all (astoundingly) horrified that after four days in the hospital we were considering leaving the country, and insisted that upon our return we come visit them again; apparently one of them has a surfing sister who lives at the beach, and a cousin in the mountains, and we are welcome to stay with any of them. Look at where we spent our vacation! Nice, eh? For five, the standard of medical care was amazing. They treated Amy's pain quickly and efficiently, communicated well despite an extensive language barrier, and provided amazing care throughout the whole ordeal. Everyone we encountered was incredibly kind and helpful, and we couldn't have been better cared for. 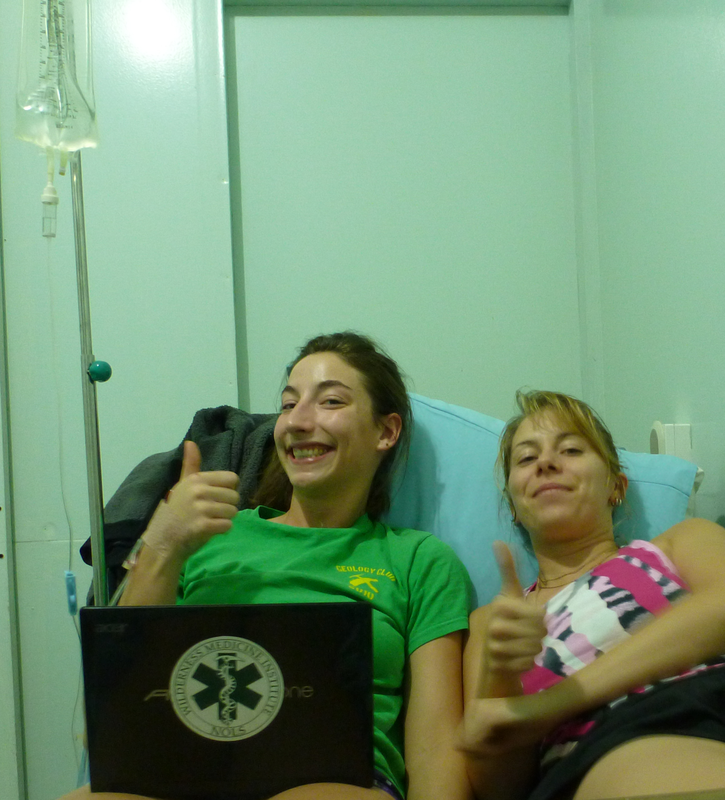 For many people, the idea of being stranded in a foreign country during a medical emergency is terrifying, but Amy and Meaghan want to point out that with every visit Amy was in a room with an IV and pain treatment within 20 minutes. Compare this to an Emergency Room in America, where you can wait several hours before seeing a doctor, let alone having your pain dealt with... and in Costa Rica, four days in and out of the hospital cost about a 20th of an American hospital. For six, and this one's the big one... Meaghan got to take a Magic School Bus Adventure down Amy's esophagus with the wonder of gastroscopic technology. It was simultaneously the most thrilling and horrifying adventure travel she's ever experienced. Watching the doctor lube up the tip of a gigantic plastic spider arm - we're talking nickel diameter here people, NICKEL DIAMETER - and shove it down her throat was slightly less on the thrilling side for Amy, especially as this served as an excellent opportunity to unexpectedly douse her stomach directly with a frothy horchata* medicine, which they had earlier served her in a snowcone cup... por el dolor. *Amy has repeatedly reassured Meaghan that despite the smell this did not taste anything like horchata, but like the existence of the geckos, Meaghan and Amy will simply have to disagree. Re-enactment of Meaghan's role during the Gastroscopia, which was to stare in horror at the camera images and click the photo button whenever the doctor said "FOTO!" which was hard to hear over the sound of Amy's delicate and graceful* retching. *Meaghan and Amy also degree on adjective use here. For seven, Amy got to see her name spelled like this on an official document! with simplicity in mind, to prevent unfortunate nicknames. FAIL. And finally, Amy got the ultimate revenge on a TSA employee. Sure, Meaghan and Amy may have both spent four days in the hospital, and only showered a single time that whole week, but it was worth it when Amy lifted her arms and that poor woman had to go straight for the armpits on the patdown. That one was for America, everyone, that one was for America. Amy even learned how to de-clot her own IV! But really, guys, it wasn't that bad. We're gonna go again, the worst has already happened, and as a bonus it turns out there's this place to tide us over. Next time we go to Costa Rica, we'll have plenty of practice cuddling sloths. We will be sloth cuddling experts. We'll have put it on our resumes, embossed it on our business cards, and created decals for our vehicles: that's how totally pro at sloth snugglin' we're gonna be by the next time we go to Costa Rica. We're sure the Costa Rican sloths can't wait.